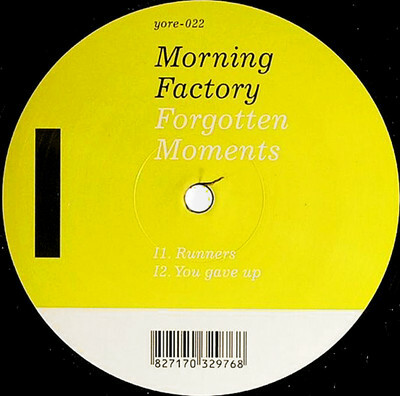 Yore starts the new year off on the good foot with a four-tracker from “Morning Factory” that’s remarkably accomplished for a first release. Expertly manning the controls are two gentlemen from The Netherlands, Jean-Pierre van der Leeuw and Jozef Lemmens, who clearly produce a high-octane electronic body music that’s timeless and fresh. Replete with dropouts and epic pulsations, “Runners” sprints in with a mid-tempo house groove that pounds so mightily, that we are scared which damage it will do out there. Opting for a less raw and epic attack, “You Gave Up” is no less satisfying in its soulful breeziness. Shifting gears slightly, the B-side’s fiery techno-funk banger “Raw Tunes” works a slinky disco pattern and aquatic dub chords into a frothy lather for seven semi-ecstatic minutes while on the EP’s last cut the lights dim slightly for the graceful stepper “Someone” to take the EP out on a wave of radiant uplift. The material seems so effortlessly realized, it makes van der Leeuw and Lemmens sound like the oldest of hands.